【8mm Ultra Compact and Lightweight Design】: 8mm Compact design is easy to carry, extremely convenient for travel and daily. Users can take this portable power bank to travel around the world and fully meet the needs for charging mobile phones, cameras and tablets. 【Fast Charge】: Auto detect the voltage and current of your device and deliver the fastest possible charge speed up to 2.4A. 15%-20% faster than normal 5V/1A input power bank. 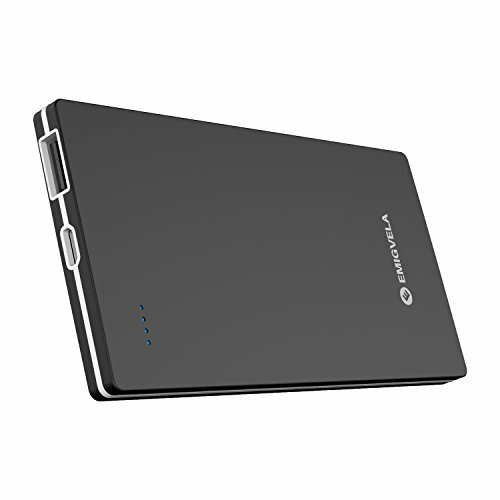 【Suitable Capacity】: Ultra slim body with 5000mA capacity made of lithium polymer battery, enough for charging iPhone twice and more.Simply connect and charging will begin automatically. 【Safe to Use】: Supports Over-charged, Over-discharged, Over-voltage, Over-current and Short Circuit Protections, Perfectly protects your digital devices from charging accident. 【100% Customer Satisfaction】: We offer hassle-free after-sale services, 30-Day money back guarantee, 360-Day warranty, Life-time technical supports. Ingenious slim, lightweight, highly portable design makes this power bank ideal & it’s charging speeds make it one of the best we’ve had.